I will repeat some of the questions here below, and would like to propose that you comment directly here below. Commenting publicly will help us to discuss ideas. If you don't feel like criticizing in public, you can proceed with the form and do it with a "fake" name / email. What information would you like to find here? What would be the perfect psybient_org? What is missing? Any other comments or ideas on how we can improve? 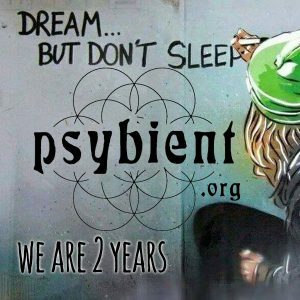 What do you LIKE about psybient_org? The more you share the better. What do you DISLIKE about psybient_org? Please be honest and critical with us! We get many compliments but would like to have more constructive criticism! You can sign in to the form with "fake" name. Your feedback is very important to us. What do you think about our website design? What do you like and/or dislike about it? Please be explicit - it is important Feel free to share links to any websites with designs that you like. Is there anything you DON'T like in the forum? What would you like to change? Apart from that I'm pretty happy with the content and presentation of the site. I've actually been thinking about doing this. I haven't committed to it yet as my time commitments in my life have just ramped up quite a bit so I'm still getting used to how much free time I can expect, but yeah, I hope to start writing reviews for you lovely people at some point I think that would add a lot of value to the site/forum. Excellent! I'll look forward to that, and of course I'll be grateful for the time and effort you'll put into this snowdrop. And I agree that it'll add value to the forum too. I have a thought, next time there's the year best poll, is it really necessary to post the results of the albums up to 100+ places ? Also, Happy Birthday. Great things have happened during these 2 years of activity. Let's hope for at least 20 more. i think it is not bad, but i guess artist from 11-111 were happy to see their name. and for us listeners it is a chance to discover something new. Cause it was hard to miss the top 10.
but i am interested to hear why you think is not necessary. Well, how many people voted for the album that was on 111 place ? Never mind, found that it is 7. But from 97-110 all got 8 votes, that means they all shared the same place, 96-79, 9 votes, same place. Also there are many artists who have a lot of releases in that list. I'm not saying that it's a bad thing, but what do I get from seeing Desert Dwellers in that list for 6 times? That is not an album. It's just a release. If the list was mainly about releases and not albums, then I stand corrected. If I remember something else I will edit it to this post. next year we will seperate albums form ep's (it was too much work). as for dessert dwellers, the conclusion is that it is an excellent band and that it shall be "listened" for those who haven't done this before. Fuluf, this year it will be much easier to separate albums, EPs, compilations, and remix albums from each other because of the addition of a type column to the google sheet where the year's releases are listed. Column K is where it says if a release is an album, EP, compilation, etc. also, if anyone is interested in helping to maintain the google sheet releases list, shoot me or Gagarin a PM with your email and we'll enable you to be an editor. Gagarin, I'm not saying that DD is a bad artist, it was just an example. I can bring out more of those who have a lot of releases. The point that I was trying to make is that instead of 1 artist having a bunch of releases in the top list, it would be more reasonable to have a new algorithm to manage with the so-called top selection. For example, if an album gets less that about 50% of the total votes in the album voting, it will not be displayed. You said in some other post that artists like to see their name in the positions and it is nice to let them know that they are in the chart, but seriously, if I'm an artist, and see that I'm in the 90th position and only about 9 people have voted for me, is that such an achievement ? Like I probably said before, it's just my opinion. It's not like everything has to change. It's just that it feels a bit dumb to showcase albums/releases which have got such a low vote count compared to the top 10. Or even top 30. Timeisart, that is big things that you posted, clears up a lot of things and it seems that next year, stuff is going to be more epic than this year. well it depends on how many polls people will want to fill out but using the genre column in addition to the release type column would create a more specialized view of what people liked that year. This would help to spread out the releases more and would give more exposure to each one than just lumping all 500+ releases into a single end of the year poll. The danger is wearing people's patience too thin with too many polls, even if all of these are spread out over several weeks. So how can we find a balance? I would definitely not bother with a poll that has me browsing a million things. For me the album/EP/compilation separation is enough. Further genre fragmentation takes it too far IMO, plus in many cases genre placement is arbitrary, especially with artists who have a wide spectrum of sound on a single album or even EP. Also, I think 100 places is enough too. Personally speaking, I'm unlikely to bother with artists outside the first 50 to be honest. ...and we're only slightly past halfway through the year. so unfortunately there is no avoiding browsing through a ton of releases with just album/EP/compilation separation alone. Sure, and that's expected, but having only three categories to browse through makes it easier. If I want to vote for an album I'll just look there, not search for possible genres. Also this allows for potentially more exposure for artists who have released only EPs or albums in a year. A large number of releases inevitably leads to a lengthy poll, there's no way around that. The fact that last year's poll organiser gave us a tick option was very helpful, and much better than me looking through my collection, bandcamp and YouTube for stuff that was released that year and then deciding what to go for. i am so curious to see what will you come up with in next update ! i love this forum, feel like home ! Just had a look at the Saafi Bros interview. Both him/them and Zero Cult, who also only answered just five questions, have been around since the big bang (or thereabouts) of psy downtempo. Is there a particular reason the questions were limited to five? I'm sure they'd have lots of stories to tell from all those years they've been active. Not to mention how they've viewed the evolution of the genre from its inception till now, or how they've changed as musicians and as people all this time. I'm obviously not a journalist or anything, I'm just talking from the point of view of the reader of these articles. thank you for feedback. Interview is a long process, i did many of them already and normal interview is taking me really long time to do (make question, recieve answers, recheck them, ask few more questions, receive answers, prepare article, find pics. And as i wanted to hear more of people, i decided to experiment format, and make more interviews. I have obviously much more question to ask, but time is limited. So in future some interviews will be short, and of course some will be long/longer. if you or anybody else want to try yourself as journalist or editor we will be happy to publish longer interviews. EDIT - Had initial post whch was asking for Youtube and Soundcloud embedding features when creating posts, but I have just seen that you can just post the links straight in and it works. This is great but I missed it initially! Idea - Something I have always loved is interviews with user generated questions. Sometimes it's nice to involve the community this way and so pretty interesting questions can arise. I would love to see a weekly podcast!